In a medium-size mixing bowl, combine the Flour, Baking Powder and Salt. Cut the Butter into 4 pieces and place in the bowl with the Flour mixture; using a pastry blender, cut the Butter into the Flour mixture until crumbly looking. Combine the Buttermilk and Egg; add a little at a time to the Flour mixture; mix gently with a fork only until the mixture is completely moistened. 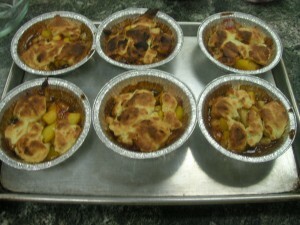 Cover the Dough and set aside until the fruit mixture is prepared. Make a cross slit X at the top and bottom of each Peach; plunge into boiling water for about 2 minutes (longer for less ripe peaches). Remove and place in Ice Water to cool. Slice the Peaches and place in a medium-size bowl. Combine the Brown Sugar, Cornstarch, Almond Extract, Butter and Spices; gently toss with the Peach slices. Place the Peaches in a casserole or deep dish pie plate; roll out the Dough to fit the top of the peaches; fit loosely over the top. Make slits in the crust for the steam to escape. Bake in an oven that has been preheated to 425 degrees for approximately 45 minutes or until the crust is golden brown; serve warm with Cream or Ice Cream.